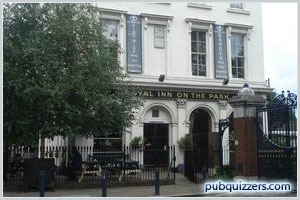 Royal Inn On The Park | Pub Quizzers | Find a pub quiz near you, now. Pub quizzes take place at Royal Inn On The Park, Hackney on Tuesdays (weekly) at 20:30. Entry is £1.00, you can have up to 8 people on a team. There are prizes of cash, drinks, food. Happy quizzing! Run by the infamous fat (not so) controller. Sweet goodies for each team at the end. Tricky jackpot round for cash that rolls over if not won. Quiz can last a little too long sometimes. Love this quiz, fat controller is a real character!